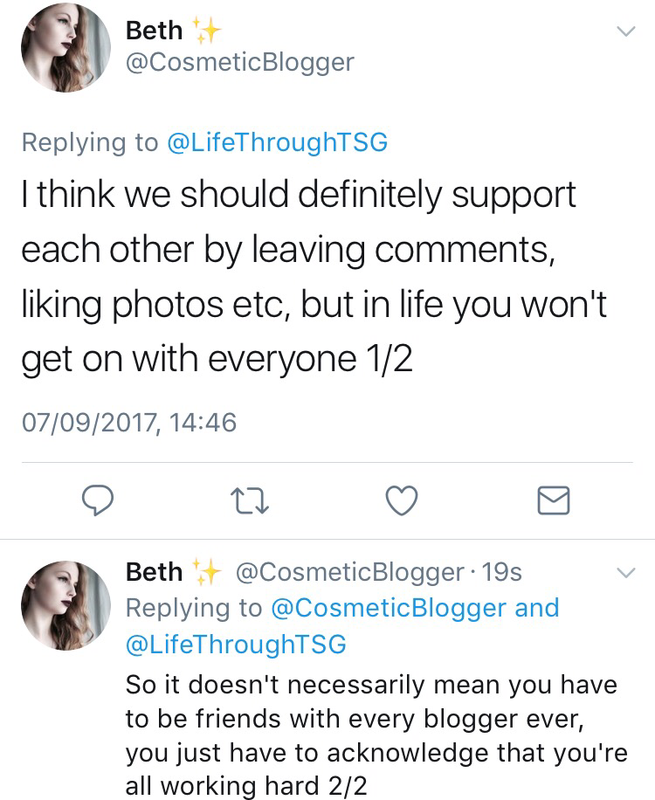 Bloggers: Do we HAVE to support each other? This is something I’ve been seeing talked about A LOT on social media at the moment. 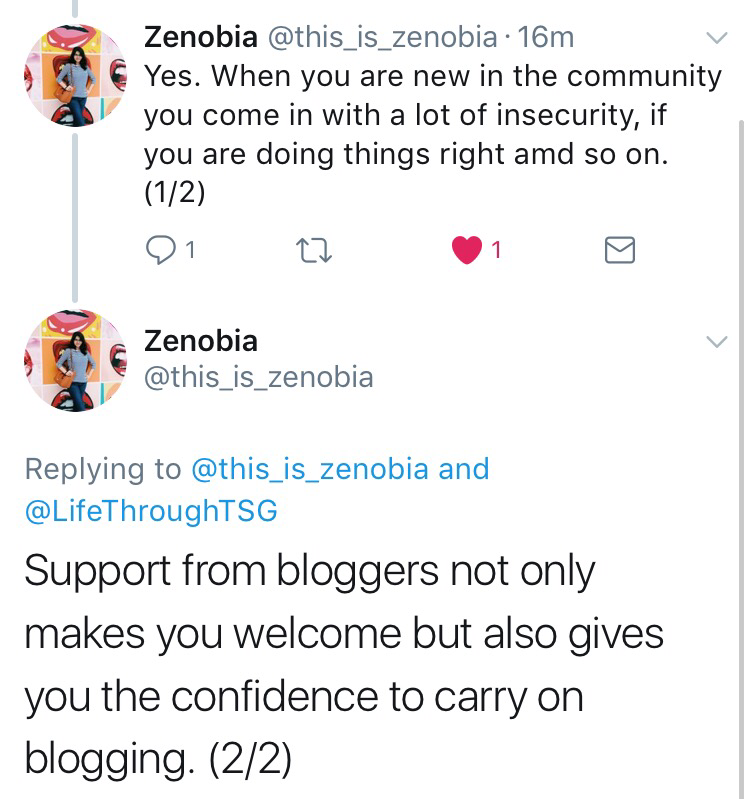 Some bloggers seem to think that EVERYONE in the community should support one another, others think that supporting other bloggers is not necessary, and many lie somewhere in the middle. I have a lot of my own thoughts on this matter, but first let’s see what other people have to say. First and foremost, I agree with the majority of responses. I have built up some great friendships through blogging, and I have those girls’ backs 100%. But I also support other people within the community. Those just starting out, small bloggers, big bloggers, and everyone in between. I LIKE to support people. But, sometimes I don’t have the time. So, when I am busy, I tend to stick to supporting my friends first and foremost, as they are people that I have a lot of respect for and I know that I really appreciate their reciprocal support. 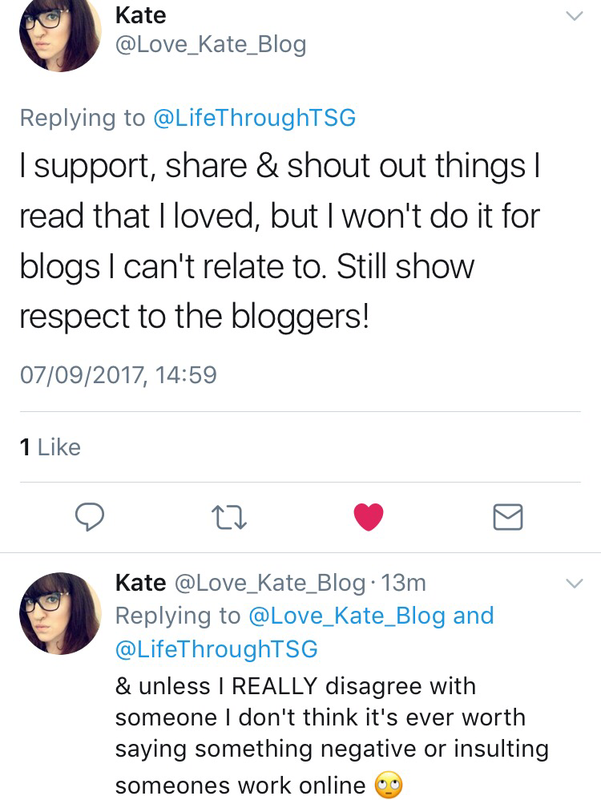 I think the main problem with the concept of ‘support’ within the blogging community is that some people take it too far. If you are supporting someone just so that they support you back, you’re doing it wrong. We all like and appreciate feedback, but feedback shouldn’t be the purpose of your blog. You should blog for you, as a hobby/job/anything else, it should be for you. Consider the current instagram phase. So many of us bloggers (myself included) are complaining about the dreadful algorithm leaving us with a lot less engagement, but I think sometimes this need to succeed and get engagement can take over from what we are actually doing. I, for example, used to be really stressed about instagram followers and likes. To the point where it would drive me insane. But I’ve given up with that a little, and I really think my photos and content are a lot better for it. And I’ve found that these photos have been doing much better now anyway, even with the dreaded algorithm! I LIKE to support people. It’s nice, it gives me warm fuzzies inside, and I enjoy it. But I don’t do it for them to support me back. Sure, that’s nice, but it shouldn’t be expected as that can be a lot of pressure on anyone. Support shouldn’t feel forced. We shouldn’t feel like we HAVE to support people we don’t know. I am big on supporting my friends, especially my blogging friends, and I enjoy doing it. But, at the end of the day, we aren’t all going to like and get along with everyone in this community, because that’s life! And we shouldn’t feel pressured to support people that we don’t like just because the community tells us too. 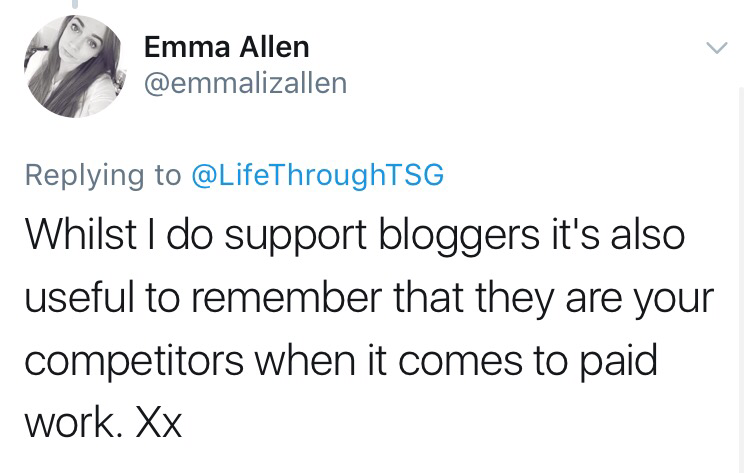 Buuuuuuuuut, saying that, I am not big on the whole seeing bloggers as our competition. I mean, ultimately, yes, they probably are our competition. But, there is room for everyone in the blogging world, no matter what your follower count, genre, or whether it’s a job, a hobby, or anything in between. There is room for all of us, and seeing each other as competition just isn’t for me. So, to conclude, I like to support my friends and other people that I get along with in this community. But, I’m not going to feel forced into supporting someone that I don’t like/whose content that I don’t agree with just because the community tells me to. 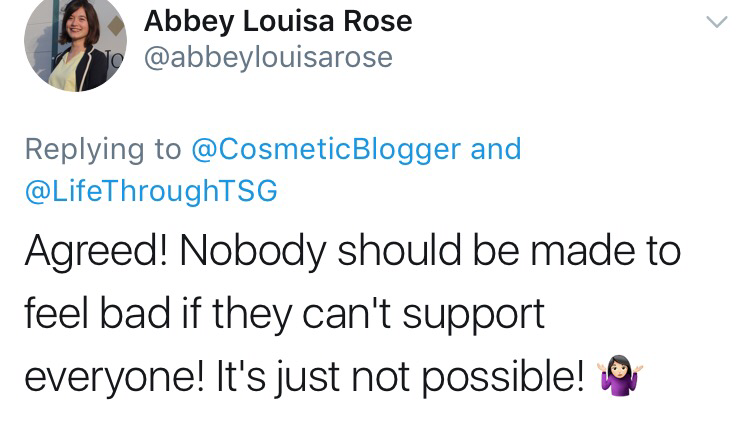 It’s not that I’m being exclusive, it’s more just being realistic because it would be IMPOSSIBLE to support every single person in this community! But, there’s room for us all, and I’m not sure I like the whole ‘competition’ idea as I think we can all be winners in this world 🙌🏻. Ok, I think that’s just about everything that I have to say! What are your thoughts on this topic? Let me know in the comments! It’s a difficult one, but I think going out of your way to find people who you can happily support and who will support you back is a good idea, and as you say “there’s room for us all”. There are bloggers who I actively dislike, though, but who I wouldn’t call out because that’s not fair. 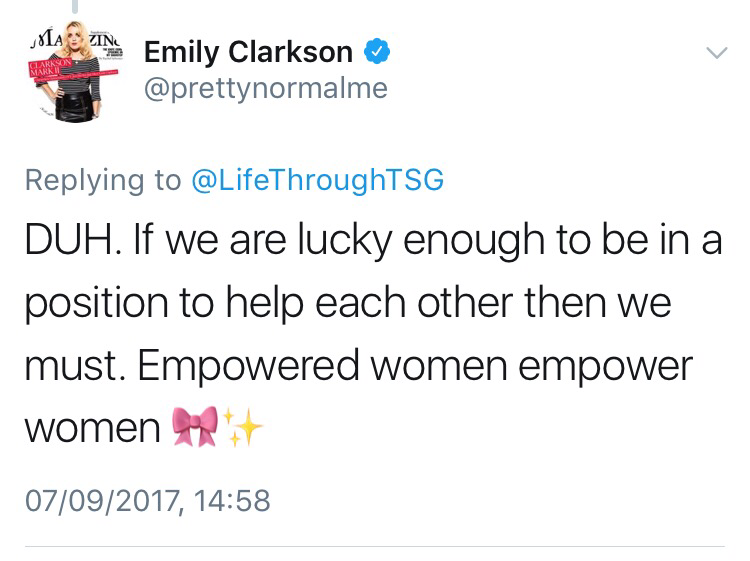 Completely agree, of course in the wide range of it all – if we all supported each other but we don’t HAVE to! 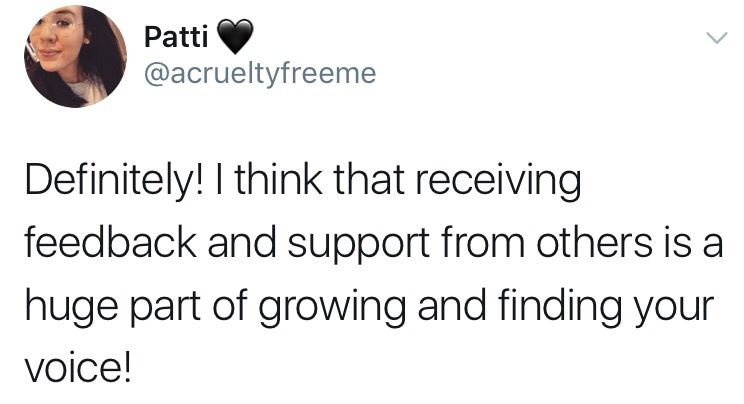 We really wish we could support everyone but it’s not possible! The spectrum of support I think can be tricky to navigate, when there’s so many bloggers all the time of all different niches and sizes – I always follow and support the blogs I love, whether a RT or a comment etc, just to show I love their content! I agree so much with this – at the risk of sounding like a generic response 😛 but one thing i’ve particularly noticed is that “supporting people for the sake of it/to gain followers”. Recently i joined my first IG pod and was so excited at first. However, what i quickly found was that the other accounts were very different to mine – and also hardly posted! That being said, i made a big effort to find something i could relate to in their latest posts and left thoughtful comments. What i consequently found was that the replies to MY latest post were very short – and included the dreaded “this is so cool!” :-/ So it has made me think – yeah, maybe that’s not for me! I much prefer searching tags and following accounts specific to my interests (crafts, books, lifestyle – but not 100 flatlays of a coffee cup!) I also find i like reading CAPTIONS. Captions that tell a story, engage people. That’s just me! I like supporting the people whose blogs have genuinely helped me too; blog posts that spoke to me. I ran a “fortnightly favourites” series for a while, where i shared blog posts that i really loved – they could range widely in the topic, but they were all genuine loves! I would say both yes and no. I do comment/like/share if I feel like it, but I won’t do it just because it’s expected that we support each other. And I do agree that we can’t support everyone. If theres one thing I’ve learned recently is that I only want to support people I identify with. Like for instance, I joined a bunch of Instagram follow trains a while back because I thought that was a good way to support each other. Turned out that most people only joined for the follow, and never followed back or engaged with others. Myself, I could feel my creativity disappear too. I quite like nature/city photography, so for me it didn’t boost my creativity to see make-up flat lays. When I decided to unfollow those I didn’t like (or who I wasn’t part of the target audience of) most of them unfollowed me too, but that’s ok. 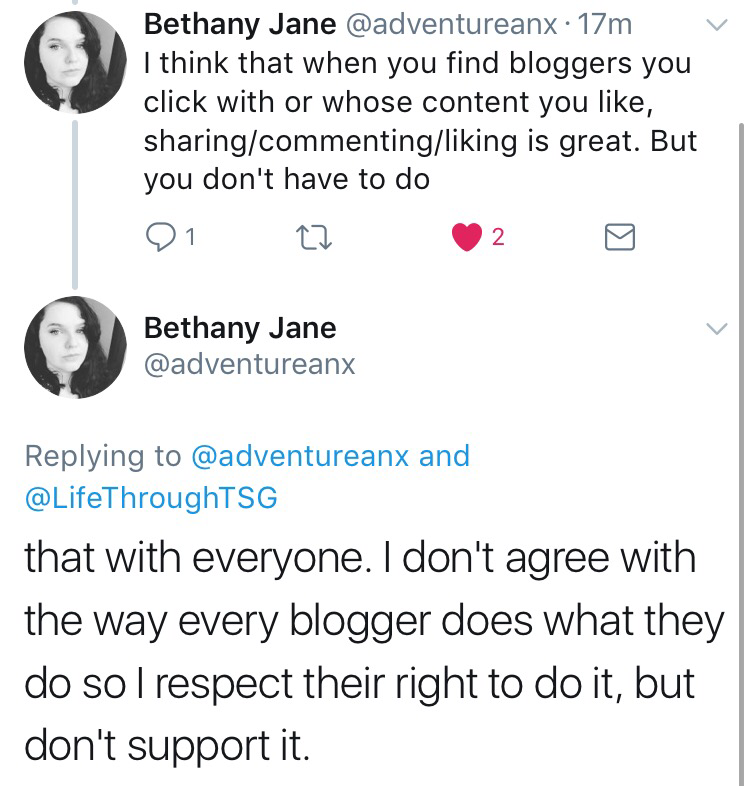 I guess what I’m trying to say is that, yes you should support other bloggers, but only if you feel like it and actually like what you’re sharing. The controversy is intriguing, but even receiving one comment can boost a new bloggers motivation to carry on. It is important to give support and also not be fake when it comes to it because in the end you are a reflection of yourself! Previous Post Transferable Trends: Bringing Blush Pink Into Autumn!